Technical Car Experts Answers everything you need: Toyota 4Runner wont shift into high gears till it gets warmed up? Toyota 4Runner wont shift into high gears till it gets warmed up? The transmission will not shift quickly into higher gear or into overdrive if it has not reached a predetermined engine temperature. It's set up this way for emissions reduction reasons. Try changing ATF oil into a mobil synthetic ATF oil . This description is applied to vehicle year 1986 to 1995. Here are the description and diagnostics for OD not upshifting. 1. Warm engine to normal operating temperature. With ignition off, disconnect electrical connector for solenoid from rear of transmission. 2. Road test vehicle and note if transmission upshifts to Overdrive once transmission shifts from "L" to "2" and then into "D" range. Reconnect electrical connector . Clear trouble codes from ECU memory, as disconnecting ECT ECU electrical connector may set trouble codes. 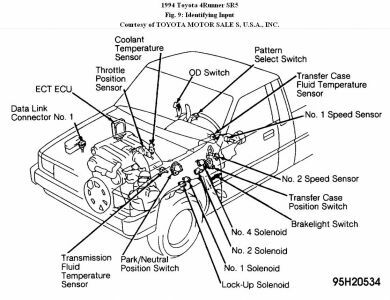 If no overdrive upshift exists, transmission is defective. If overdrive upshift exists, proceed to step next step. 4. Road test vehicle and ensure voltage at terminal TT increases from zero to 7 volts. If no voltage exists, check for 12 volts between terminals "L" and E1 on ECT ECU with connector installed on ECT ECU and shift lever in "D" position with ignition on. See Fig. 25. If 12 volts exist, check for defective park/neutral position switch or wiringcircuit. If 12 volts do not exist, replace ECT ECU. volts do not exist, replace ECT ECU. 6. If voltage increases from zero to 7 volts, transmission or solenoid is faulty. If voltage increases from zero to 5 volts, connect voltmeter between terminals OD2 and E1 on ECT ECU with connector installed on ECT ECU. 7. Turn ignition on. Check voltage with OD switch in released (OFF position) and depressed (ON position). No voltage should exist with switch released and 10-14 volts with switch depressed. 9. Check voltage between terminals OD1 and E1 on ECT ECU with connector installed on ECT ECU and ignition on. Voltage should be about 5 volts. If voltage is correct, replace ECT ECU. If voltage is not correct, proceed to next step. 10. Disconnect electrical connector from cruise control Electronic Control Unit (ECU). See Fig. 9. Check voltage between terminals OD2 and E1 on ECT ECU with connector installed on ECT ECU and ignition on. If voltage is now about 5 volts, replace cruise control ECU. If voltage is not about 5 volts, check for defective cruise control ECU wiring. If wiring is okay, replace ECT ECU. 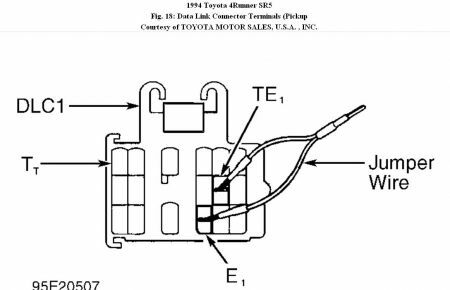 Labels: Toyota 4Runner wont shift into high gears till it gets warmed up.